Fox Point/Wickenden Street Bath House has been saved. The City redeveloped this unused structure as a community resource room/library facility. Half of the financing for the $400,000 project came from Ward 1 bond money; the remainder came from city bond money. Many congratulations go out to the community and local legislators that helped push for this project to happen. As European immigrants streamed into Providence at the start of the 20th century they found jobs, livelihoods, and community, but generally not running water. Rhode Island’s industrial might may have originated in its powerful rivers, but for many poor immigrant families, not even a trickle made its way to their crowded homes on the East Side. To mitigate the obvious health dangers associated with the lack of indoor plumbing and encourage frequent bathing, the city of Providence began providing public bathing facilities as early as 1913. 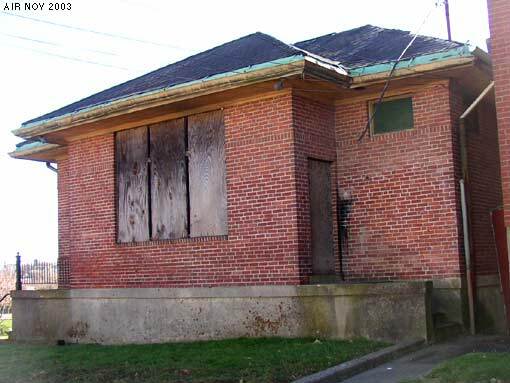 In 1926, construction was completed on the Wickenden Street Bath House in Fox Point. The Bath House provided area residents with a way to stay healthy and clean as well as a social center and community meeting place. Now vacant and derelict, the one-story brick and slate building at 455 Wickenden Street sits directly adjacent to the Vartan Gregorian Elementary school. A 1953 zoning law requiring hot running water in all residential buildings proved the death knell for the bath house, which found use as a library and a storage area until falling into neglect in the 1970s. Today, the low-profile structure suffers from vandalism, pigeon infestation and a leaky roof, but the building is fundamentally sound and there is a possibility that the structure can somehow be more closely incorporated into the neighboring elementary school or restored to a center of community activity. The Wickenden Bath House made PPS’s Ten Most Endangered List in 1998, 1999 and 2002, but finding a new use for the old building has proved challenging and the bath house is on the list once again in 2003. We hope the current plans to renovate the structure go through. Carol Parent Jan 25 2009 I lived on Schofield Street from 1961-1968. Both my parents lived there too as children. They also lived on Williams St. and Sheldon St. I attended Fox Pt. Elementary and was a student participating in “Headstart”. Now I realize that I was part of the 60s movement towards better education. I did visit the library that was next to the old bath house as well as swim in the public pool that was on the corner of Wickeden and I believe Ives St. I remember the local grocery where I was sent by my Vavao to buy goat cheese and you could say “put it on our tab”. I also remember that my Aunt Mary would send me for a pack of cigarettes! How things have changed. Like many Foxpointers I attended Holy Rosary Church and have pictures leaving the church after I made my first communion. M DePaiva I was born and grew up in Fox Point and lived on 273 Wiickenden Street in the 40s and 50s. It was still being used as a bathhouse then. This was before the Vartan Gregorian Elementary school. I remember playing baseball at the park next to the bath house, and if I remember correctly there was also an outdoor swimming pool. I attended Arnold Street Elementary until the 3rd grade, then Thayer Street Elementary for a couple of years until the city sold the property to Brown University. Until the elementary school in Fox Point was built a couple of years later, the Fox Point children went to Nathan Bishop JH. I finished JH at Nathan Bishop then went on to Hope High, graduating in 1958. I left right after that to enlist in the Air Force. My mom and dad lived in Fox Point until the mid 60s. Both have passed away now and we held their funeral services at the Holy Rosary church; which I think is one of the most beautiful churches I’ve ever seen.